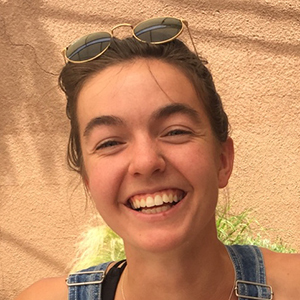 Zoey is a native New Mexican with a passion for local food systems and the communities that support them. Zoey also works part-time with the Rio Grande Agricultural Land Trust, protecting land and wildlife in the Rio Grande Valley through conservation easements. Previously, Zoey was the program coordinator for Tres Hermanas Farm, a refugee agriculture program in Albuquerque, NM. She also managed Albuquerque’s Downtown Growers’ Market and was part of the Rail Yard Market organizing team. She currently sits on the Agrarian Trust Board and remains an advisor to the Rio Grande Community Farm. Zoey spends weekends with her partner Carlos, managing his family’s 30-acre farm in Polvadera, NM where they grow organic vegetables and grass-fed beef. In her free time, you’ll find her running along acequia banks, climbing mountains, and preparing meals to share with friends and family.